When TOC's Senior Food & Drink Correspondent Heather Shouse started writing her forthcoming book, Food Trucks: Dispatches and Recipes From the Best Kitchens on Wheels, Chicago had perhaps the lamest food truck scene in the country. But just a year or so later, Shouse's book is about to come out, and the food truck scene has become robust enough that she will host a book release party in conjunction with the Book Cellar and Goose Island that will double as the city's first food truck summit. The summit will happen in the parking lot of Goose Island Brewpub on Tuesday, April 19th, from 7-10pm. (The book party will take place just feet away, inside Siebel Hall.) Participating food trucks include Flirty Cupcakes, The Southern Mac, Sweet Miss Giving's, Tamalli Space Churros, Empanadas, Hummingbird Kitchen and gaztro-wagon. 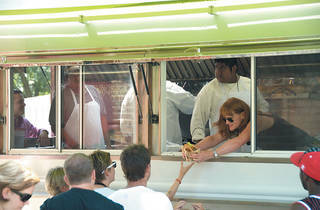 Each truck will offer a signature item (as opposed to their full menu). Anybody who knows Ms. Shouse knows that if there's one thing she's more passionate about than food trucks, it's beer. So it should come as no surprise that the book party in Seibel Hall will also feature a limited edition collaboration between Shouse and head pub brewer Jared Rouben. It's a Belgian saison and it's called, naturally (considering the event it's being released at), Curbside.